The Crochet Coral Reef is an ongoing worldwide project by Australian twin-sisters Margaret Wertheim and Christine Wertheim and their Los Angeles based Institute For Figuring. 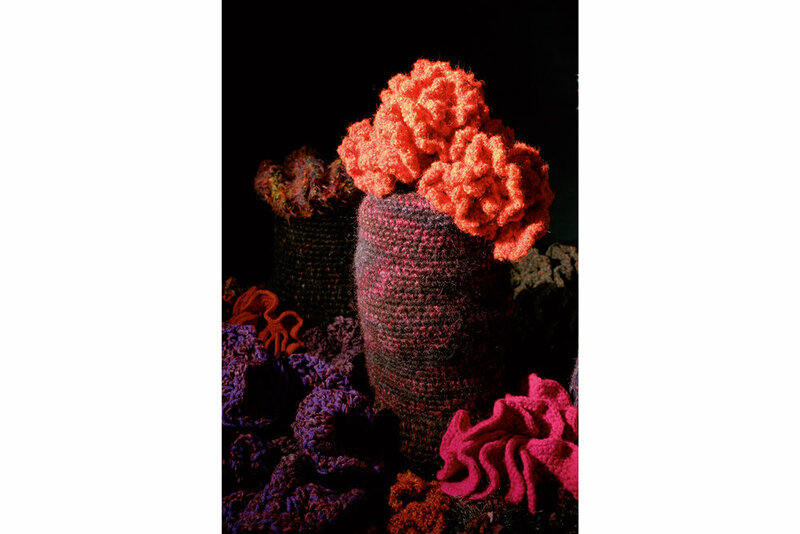 Responding to anthropogenic crisis, the work simulates living reefs using techniques of crochet to mimic in yarn the curling crenelated forms of actual reef organisms. Corals and other frilly reef creatures, including sponges, kelps and nudibranchs, are biological manifestations of “hyperbolic” geometry. Through an unlikely fusion of mathematics, marine biology, handicraft and collective art practice, the Wertheims and their contributors produce large-scale coralline landscapes both beautiful and blighted. 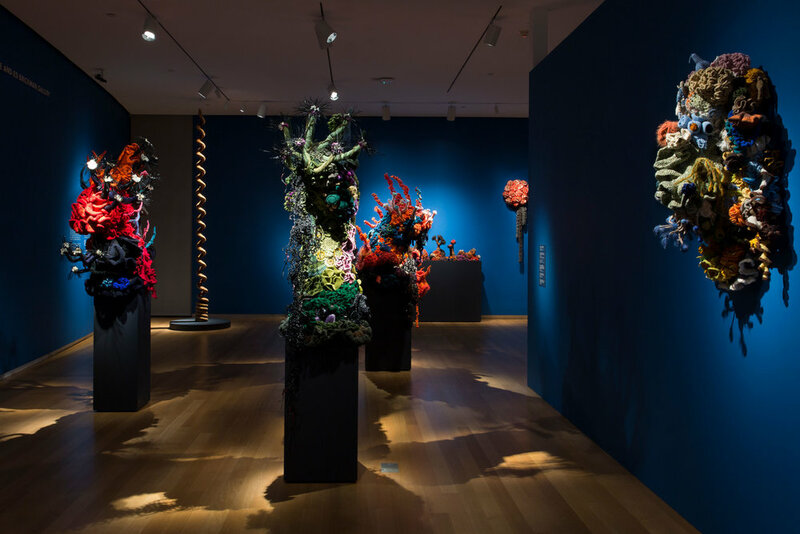 At once figurative, fantastical, worldly and dispersed, the Crochet Coral Reef offers a monumentally tender response to dual calamities devastating marine life: climate change and plastic trash. Anchored in the fields of both ecology and geometry, the Crochet Reef began in 2005, when – in response to devastation on the Great Barrier Reef in their native state of Queensland – the Wertheims conceived the idea of constructing an artificial reef, based on the fact that corals, kelps and other sea creatures are biological incarnations of hyperbolic geometry, an alternative to the usual Euclidean variety. Though nature has been making hyperbolic structures for hundreds of millions of years, mathematicians spent centuries trying to prove them impossible. In the liquid laboratory of the sea, hyperbolic space becomes a basis for novel physiologies, and in the threadings of the Crochet Reef it opens a door to an imaginative play practice in which art and science together generate a material science fiction. 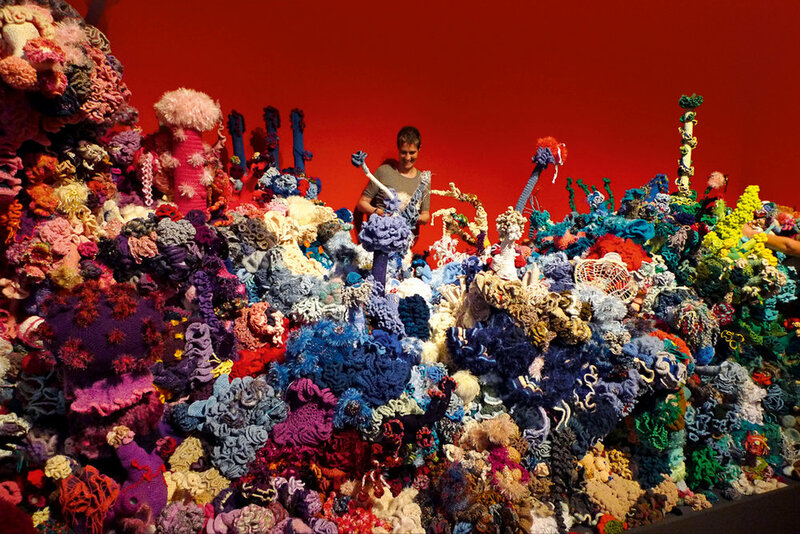 The Crochet Coral Reef has been exhibited at the Hayward Gallery (London), Museum of Arts and Design (New York), Deutsches Museum (Munich), the Smithsonian's National Museum of Natural History (Washington D.C.) and many other places. Living reefs are often called the "rainforests of the ocean” and the vastly diverse ecologies of the Wertheims' reefs have also evolved into dazzling taxonomies of "organisms," constituting an ongoing Darwinian experiment in yarn. Each crochet "species" is descended from the simple seeds of a mathematically pure hyperbolic crochet surface discovered by Cornell mathematician Dr. Daina Taimina. By morphing and complexifying an underlying code – the pattern of crochet stitches – a dynamically unfolding, wooly "tree of life" has been brought into being. In this marriage of mathematical experimentation and material play the Crochet Coral Reef constitutes a novel alliance between science and art characterized by process, development, and open-mindedness; here, the art-making activity itself recapitulates processes at the heart of organic evolution. Thus art becomes a tool not just for learning about science, but for enacting methodologies within nature that science uncovers. Also inspired by nature's methodology is the project’s participatory dimension. In addition to the reefs the Wertheim’s construct themselves – incorporating pieces from a group of Core Reef Contributors – the sisters work with communities around the globe, empowering citizens to make their own local Satellite Reefs. To date more than forty Satellite Reefs have been constructed in cities and countries from New York, London, Chicago and Melbourne, to Ireland, Latvia, Germany and the United Arab Emirates. This ever-growing wooly archipelago has entailed nearly 10,000 participants, with resulting exhibitions seen by more than two million visitors, making the project perhaps the largest art & science endeavor on the planet. 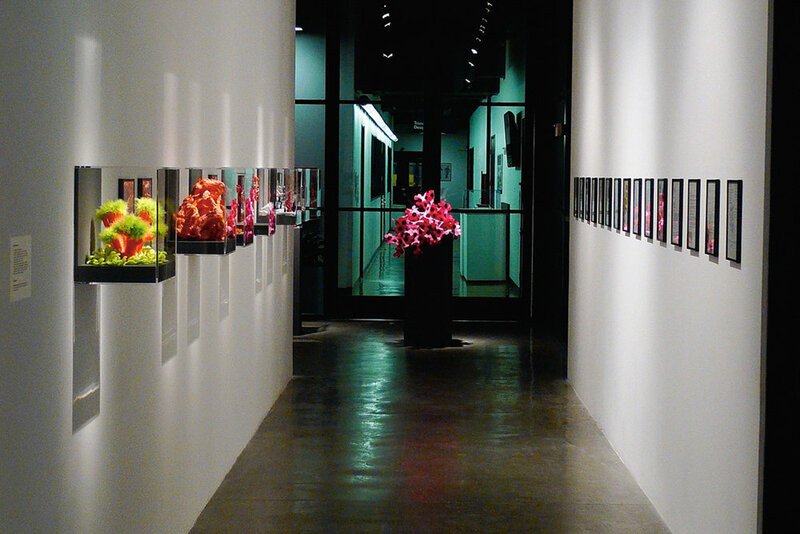 By inviting in people from all walks of life – scientists, housewives, teachers, computer programmers, sheep farmers, prisoners, and shelter residents among them – the Crochet Coral Reef offers a radical alternative to the model of artist as singular prodigy. Just as living reefs result from collaboration between billions of coral polyps who collectively construct such marvels as the Great Barrier Reef, so crocheted Satellite Reefs embody the creative potential of crowds.